The concept of SPF swimwear is becoming much more popular because of the increasing concern over excessive sun exposure and its potential negative effects and skin cancer. From the beaches to the rivers, lakes to the waves, or just the swimming pool in your back yard - wherever there is water, people are wearing UV protective swimming gear more and more. fishing... the list goes on! Not all swimwear is SPF rated. Each item can be tested and approved by similar certification bodies that test for sunscreen SPF (UVB) levels as well as UVA protection levels. The result is a UPF (Ultraviolet Protection Factor) which refers to both UVA and UVB protection. Usually you can see which method has been tested as it will state this fact on the label. Eg the American Association of Textile Chemist and Colorist test Method 183. 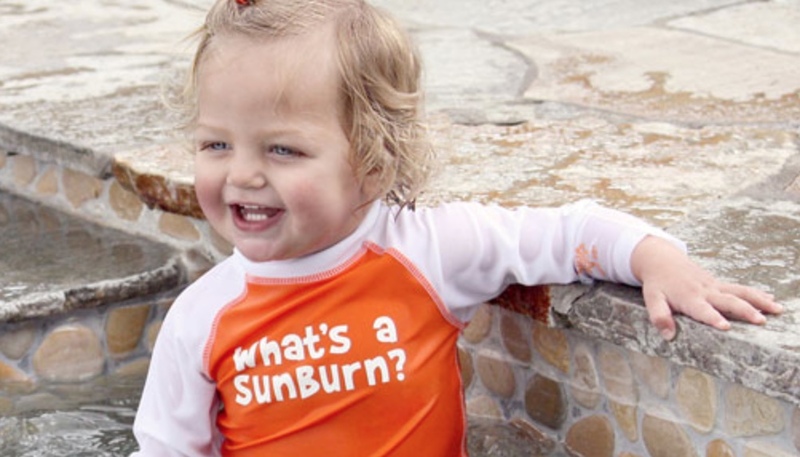 Protects your baby from the harmful UV rays of the sun while at the beach, swimming pool or anywhere outdoors in fact. These have a UPF certification and are lightweight, with a breathable cover with elastic at the upper corners to hook over a baby stroller. A great tool for helping young swimmers build their water confidence. Made of a soft neoprene, usually in bright colors for easy identification, with UPF 50+ sun protection. These are perfect for keeping the little ones warm in the water as all children under the age of 2 find it difficult to regulate their body temperature, even when in a relatively warm pool. Wetsuits are therefore increasingly popular for the young ones as they are not heavy and cumbersome to wear. Made from 2mm thick ultra lightweight titanium neoprene, they provide warmth and flexibility, and are made in all sizes. A wrap design for the younger ages of 0 - 6 months and 6 - 12 months, they usually have a velcro fastening to allow for easy fitting. The design often incorporates being able to open the garment out flat, so you can lay your baby down for fitting. The 1 - 2 yr old size, however, allows for more active and co-operative little people by having an opening at the top and the bottom for them to step into easily. The fabric used for SPF swimwear is specially made to block out UV rays very effectively even when wet. Normal, untreated clothing tends to lose almost half of its UPF blocking abilities when wet, which allows for greater contact with UV rays. But remember, no matter how much the body is protected by the SPF swimwear, there will be some areas still exposed - arms, chest, neck, ears, face, hands, legs, and feet are common. So, find a non-toxic, non-chemical natural sunscreen to complement the SPF swimwear.